This is for my sisters and brothers that feel the passion deep inside. For people who believe that our world can be a beautiful and safe place for everyone. And for people that are pissed off that it’s not. This is guide is for YOU. You have an opinion and your voice matters. 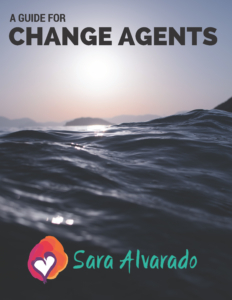 You are a Change Agent and the world needs you more than ever. To receive the pdf of this guidebook in your inbox, you need to sign up and then it will be emailed to you. You can always unsubscribe later. I don’t blog very often but when I do, it will get delivered to you as long as you are subscribed. Once you have the pdf of the guide book, you are welcome to share it with anyone. If you want a hard copy mailed to you, please email me at sara@thealvaradogroup.com. *I honor the privacy of your email address and promise not to share it.